For most of Photoshop's lifetime, converting color photos to black and white has left many people feeling blue. Sure, there's been quick and easy ways to go about it, like simply desaturating the image or converting it to Grayscale, but these methods gave us no control over the process, leaving Photoshop to throw away color information any way it saw fit, and the results were usually less than spectacular. We've had slightly better and more impressive sounding ways of converting to black and white, like switching over to the Lab color mode to separate the color from the lightness values in the image, but even then, we had no control over the results. In fact, up until recently, the only way to gain control over the conversion was to use Photoshop's Channel Mixer, which was fine as long as you understood a thing or two about how Channels work. Even then, using the Channel Mixer never really seemed natural because it forced us to think like Photoshop rather than asking Photoshop to think like us. For something as common as converting color photos to black and white, there had to be a better way. Fortunately, the folks at Adobe agreed, and in Photoshop CS3, they introduced the only tool you'll ever need to convert your color images to black and white. It's called the Black & White adjustment, and it's easy, it's totally natural, and it's even lots of fun! In fact, it's so simple that anyone can use it regardless of their skill level! With the Black & White adjustment, you can easily emphasize certain areas of an image and de-emphasize other areas based on their original colors, without having to know anything about Channels or what Photoshop is doing behind the scenes to display color. Want the sky to be darker in the black and white version of your photo? Just drag the Blues slider towards the left. Need skin tones to appear lighter? Drag the Reds slider towards the right. Does the brightness of the grass or the trees need a little fine tuning? Drag the Greens slider left or right until you get it just the way you want it. It's really that simple! 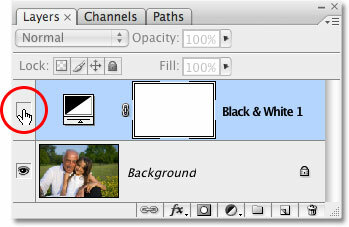 As with most image adjustments in Photoshop, the new Black & White converter comes in two flavors. There's the standard pixel-based version found by going up to the Image menu and choosing Adjustments, and there's the adjustment layer version. We're going to focus entirely on the adjustment layer version, since as we saw in the Non-Destructive Photo Editing with Adjustment Layers tutorial, adjustment layers allow us to work flexibly and non-destructively on our images. 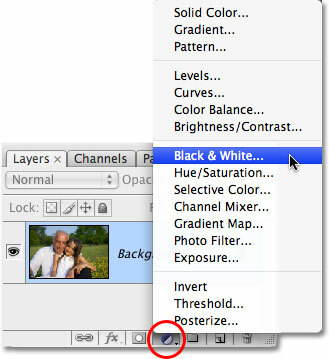 Since the Black & White adjustment was introduced in Photoshop CS3, I'll be using CS3 for this tutorial. Of course, you'll need at least Photoshop CS3 as well if you want to follow along. 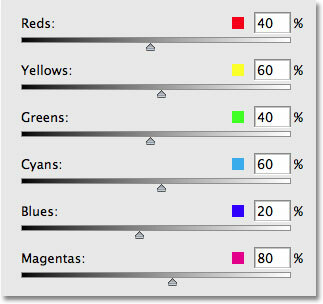 Selecting a Black & White adjustment layer. The Black & White dialog box, with six main sliders that control different primary colors in the photo. These sliders adjust how bright or dark each color will appear in the black and white version, and we can use them to emphasize or de-emphasize certain objects or areas in the image, brightening areas we want to bring attention to and darkening less important areas, based entirely on the original color of those areas. Dragging a slider towards the right will brighten areas that contained that color, while dragging a slider to the left will darken areas that contained the color. There's really nothing more to it than that! Photoshop instantly applies a default black and white conversion as a starting point. Dragging the Blues and Cyans sliders towards the left to darken the sky in the photo. Darkening the sky a little helps brings attention to the main subjects in the foreground. Making changes that are too drastic may cause banding, depending on the image. If you did go too far with a slider, you can undo the last change you made either by going up to the Edit menu at the top of the screen and choosing Undo or, for a faster way, use the keyboard shortcut Ctrl+Z (Win) / Command+Z (Mac). Of course, you can also simply drag the slider itself to undo the change. 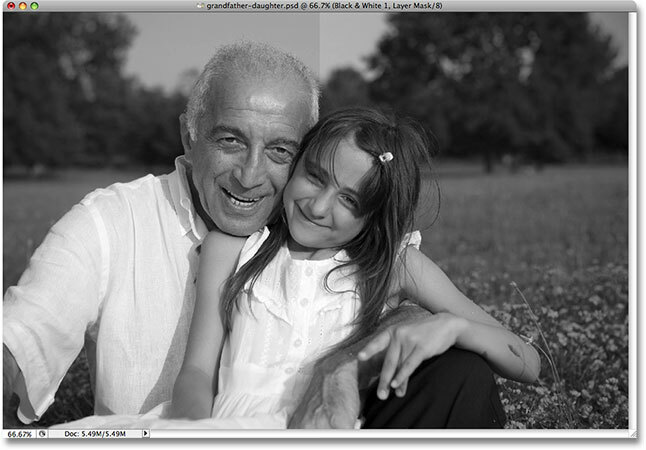 Dragging the Reds slider towards the right to lighten skin tones in the black and white version. The skin tones now appear lighter in the black and white version after dragging the Reds slider towards the right. The man and the little girl are now clearly the main focus of the image, but they seem to stand out a little too much. They're too bright in front of the background. To fix that, I'll brighten the grass and the trees behind them to blend everything in more naturally. Now, so far we've been lucky. We knew that skies are usually a combination of blue and cyan, and we knew that skin tones contain lots of red, so when we wanted to darken the sky or lighten the skin, we knew which color sliders needed to be moved. But what if we don't know which sliders to move? What if we don't remember what the original colors in the image were? I want to brighten the grass and the trees, but let's pretend for a moment that I fell on my head and can't remember what color grass and trees are. There's a couple of things I can do, besides seek medical attention. Click the eyeball icon to temporarily turn off the Black & White adjustment layer. The full color version reappears. 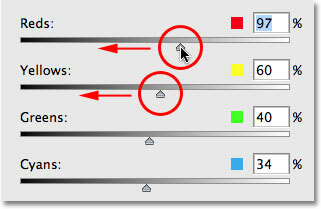 Click the Layer Visibility icon once again to turn the Black & White adjustment layer back on. At this point, since I know that I need to adjust the green colors in the image, I could simply drag the Greens slider towards the right to brighten the grass and trees. However, I'm not going to do that because there's an even easier way to do this. 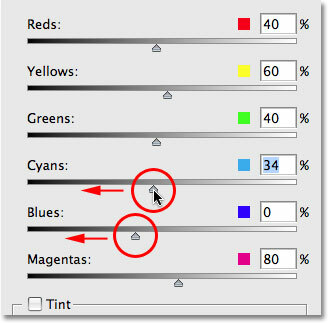 If you ever need to adjust the brightness of something in the photo and you don't know what the original colors were, simply click on the area in the photo and, while still holding down your mouse button, drag your mouse left or right! This has the exact same effect as dragging the color sliders in the dialog box but without having to actually drag the sliders or even know which slider to drag! As you drag your mouse to the left, the area you clicked on, as well as any other areas in the image that contain the same color, will appear darker. Drag to the right and you'll lighten the area, as well as any other areas with the same color. 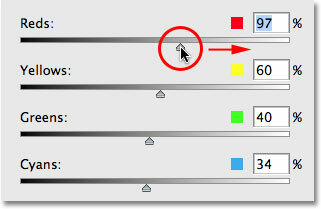 Click on an area you want to adjust, then simply drag left or right to darken or lighten the area. Notice how brightening the grass and trees also brightened the flowers in the bottom right corner of the photo. You may have noticed as well that the skin tones have become a bit lighter. Even though it doesn't seem obvious, there's actually more yellow than green in plants, so when I clicked on an area of the grass to brighten it, Photoshop selected both greens and yellows. Since the flowers in the original photo were yellow, brightening the grass also brightened the flowers. And since skin tones often contain yellow, as they do in this photo, they were also brightened when I brightened the grass. You may need to re-adjust certain areas after lightening or darkening other areas of the image. The final black and white conversion. 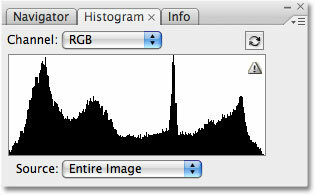 The histogram showing that areas in the image have become pure black (left) or pure white (right). 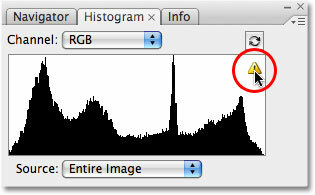 Click on the warning icon to update the histogram with the current image data. Each time you make a change with a slider in the Black & White dialog box, or each time you click and drag directly inside the image, you'll want to update the histogram and check to make sure you don't see any spikes on the far left or right. If you do go too far, simply press Ctrl+Z (Win) / Command+Z (Mac) to undo the last change you made, then update the histogram again. Using the Histogram palette along with the Black & White adjustment is an easy way to make sure you get the best possible black and white results without losing any image detail. And there we have it! That's our look at the new Black & White image adjustment in Photoshop CS3! Check out our Photo Retouching section for more Photoshop image editing tutorials!